The company, MagnaReady, started when Maura Horton came up with a way to help her husband button his shirt. His Parkinson’s prevented him from doing so on his own, so she used magnetic closures so he could fasten his shirt without the need for finger dexterity. How does this apply to a working, pumping mom? Not having to button and unbutton a dress shirt several times a day! The MagnaReady shirt ($64.95 or two shirts for $119 with free shipping) is a standard button-down, but unlike a dress shirt, the little white buttons down the front are just for looks. Hidden inside the placket of the shirt are powerful magnets that link together for a secure closure. It’ll give you a professional appearance without the hassle of manipulating tiny buttons into buttonholes — over and over throughout the day. You can dress it up or down, but no matter how you wear it, it makes getting dressed easier. It also makes getting to your milk source easier when you only have one hand available if you’re actually with your baby. 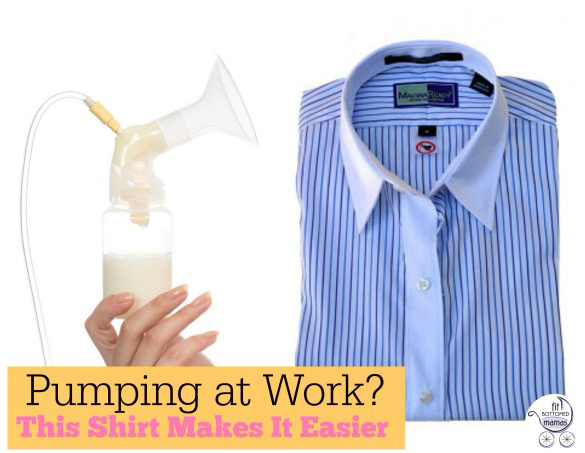 The shirts are wrinkle-free and stain-resistant and importantly, machine washable. To wash it, simply press the shirt closed so the magnets are stuck to each other and the shirt will tumble around the wash cycle without attaching to the machine.